This handset is compatible with the Yealink W60H base. You do not need to dial any numerical prefix before dialing an extension or external number. Simply dial the extension or 10 digit number. Up to eight handsets can be paired with this base station. 1. Press the OK key. 2. Select Settings > Registration > Register Handset. 4. Press the OK key and then enter the Pin: 0000. Note: If this pin is not accepted, or if registration fails, contact Customer Support for assistance. Each handset that is paired with this base station can be assigned a unique line. 1. From the admin portal, click Devices in the left sidebar. 2. Click the Yealink W53P that requires additional lines. 3. From the Button Configuration tab, select LINE and then choose the desired line. 4. Repeat step 3 for each additional line. Note: You must power cycle the base station to apply any changes made to its settings. 1. On the handset, press the OK key. 2. Select Status > System Status and then write down the phone’s IP Address. 3. Open an incognito window in Google Chrome, type the IP address into the address (URL) bar, and then press Enter on your keyboard. Note: If the web UI does not load, enter https:// before the phone’s IP address. 4. Enter the Device Admin Password. You can find this password within the Jive Administration Security tab. 5. Go to Account > Number Assignment. 6. From the Incoming Lines tab, assign a Line No. to each Handset No. This will be the line used for inbound calls. 7. From the Outgoing Lines tab, assign a Line No. to each handset. This will be the line used for outbound calls. 2. Select > Call Forward. 3. Enable the desired forwarding type. Always: Forwards all incoming calls. No Answer: Forwards all unanswered incoming calls. Busy: Forwards calls that arrive when you’re already in a call. Note: Call Waiting must be disabled (Menu > Features > Call Waiting) to enable Call Forward Busy. 4. Enter the internal extension or external number to which calls will be forwarded. 5. If you selected No Answer, enter how many rings to wait before forwarding. 6. Press the Save softkey (to disable call forwarding, disable the forwarding type). Enabling DND stops your phone from ringing and sends all incoming calls directly to voicemail. Calls are logged in your Missed Calls. 2. Select > Do Not Disturb. 3. Use the left/right arrow keys to enable/disable. 4. Press the OK key. 2. Dial your password (default 0000). This device does not support this feature. 1. While on an active call, press the Options softkey. 3. Dial the internal extension or external number to add to the conference. 4. Wait for the second party to answer, and then let them know that you would like to add them to a 3-way call. 5. Press the Conf softkey. Places a current call on hold and allows you to speak with the other party before transferring the call to them. 3. Dial the internal extension or external number. Tip: To cancel a warm transfer, press the End softkey. This will take you back to the original call. 4. Speak with the destination party. 5. Press the Transfer softkey. A blind transfer routes a call to another party without speaking to them first. 4. Press the Transfer softkey before the call dials out. Tip: To transfer a call directly to voicemail, dial 0 + extension. 1. Press the Options softkey. 3. Press the Resume softkey to retrieve the call. 2. Select > Audio > Ring Tones > Melodies. 3. If there are multiple lines assigned to the device, scroll to the line you wish to modify. 4. Use the left/right arrow keys to select the desired ringtone (highlight to sample ringtones). 5. Press the Save softkey. Note: This device does not support silent ringtones. *Softkeys are buttons located around the display whose function changes depending on the context. These keys are managed by your system administrator. See a feature you don’t understand? See our phone feature glossary. *Call waiting must be disabled. Verify a device profile has been created. Verify the phone’s MAC address has been assigned to the device profile. 1. Press the OK button. 2. Select Status > System Status and then write down the phone’s IP Address (it may scroll to display the entire address). Note: If this password is not accepted, contact Customer Support for assistance. 5. Go to Phone > Auto Provision. 6. Enter http://‹domain›.onjive.com/p for the Server URL. Note: Replace ‹domain› with your unique domain (found in parentheses at the top of the admin dashboard). 7. Click [Confirm] > [Auto Provision Now]. 8. Click [Yes] to reboot. Note: Once your phone reboots, you must manually power cycle the device as well to apply its provisioning settings. After a factory reset on a phone, you’ll need to reset secure provisioning from Jive Administration as well so it can reconnect to Jive. 1. Click Devices in the left sidebar. 2. Click the device that needs secure provisioning reset. 3. From the Hardware tab > Reset Secure Provisioning, click [RESET]. 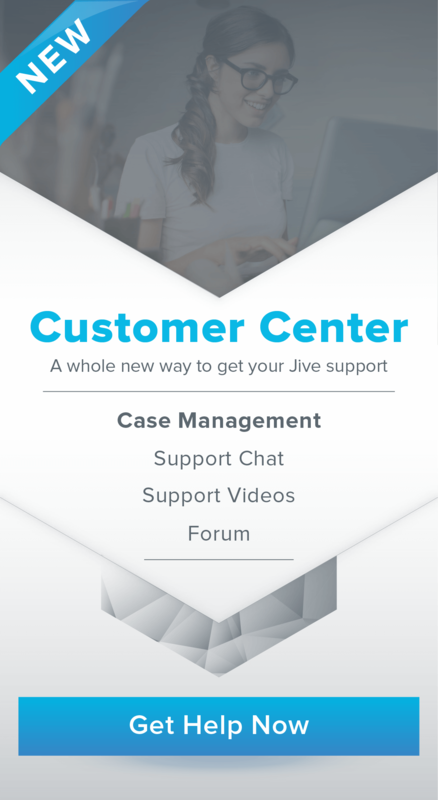 Below is a list of known compatible accessories for your device supported by Jive. Significantly extends the wireless coverage area between the base station and cordless handsets. Two RT30 repeaters can be cascaded to further increase your coverage area.